CRM for New Home Agency is a perfect solution for Real Estate Agencies who focus on Projects/Developments (Instead of individual Properties). Built on award-winning Zoho Creator, it handles everything that’s required for a New Home Agency to run their business: Assigning users to different Developments and their related Units, Parking Units, Storage Units, Cabana Units, Managing leads, customers, transactions, One-click generation of commission invoice and Managing myriads of activities. Assign Users to Different Developments. Capture Developments, Units, Parking Units, Storage Units and Cabana Units. Capture leads for different Developments. When the lead is ready for an Offer: Convert the Lead to a Customer and a related Transaction. Track Transaction as it moves through the various stages. Once the contract is signed by the buyer – you can generate your Commission Invoice in one click and submit to Developer. Emails are tagged against the relevant lead and customer. 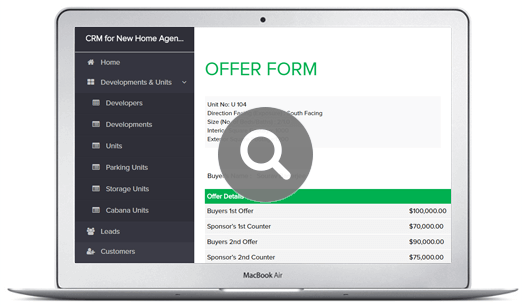 CRM for New Home Agency is built on the Premium Edition of Zoho Creator. We will deliver you CRM for New Home Agency within 10 Working Days. How Much Does CRM for New Home Agency Cost? CRM for New Home Agency is available at an One-time fee. However you need to pay subscription fee for Zoho Creator. Can I Further Customize CRM for New Home Agency in Future? Can I Have a Demonstration Before I Buy CRM for New Home Agency?